Chef Federico Heinzmann each day cherry-picks nature’s best ingredients, cooks them using ingenious recipes and delivers his creations on the table in ways uniquely Korean and earthly at the same time. Working with Korea’s renowned Buddhist monks, the Argentine executive chef at Park Hyatt Seoul’s The Lounge has dug deep into the country’s culinary roots in search of innovations, which would satiate even the trickiest bon vivants worldwide. Heinzmann came to Korea seven years ago from his multicultural homeland, where “everyone has traces of different cultures, backgrounds and tastes.” His peripatetic global tour has also given him “fresh eyes” to see things in entirely different ways, the Argentine stressed in an interview. Unlike in the past, when fine dining largely centered on French cuisine, the new connoisseurs progressively look for dishes that are cooked with seasonal ingredients and local recipes, he highlighted. As gourmet dining has become more about “unique local foods,” this change gives Korean restaurants all the opportunities to earn Michelin stars and promote their delicacies on the world stage, he contended. In this vein, The Lounge, the hotel’s teahouse-restaurant, has been consulting three Buddhist monks to peer into their timeworn gastronomies and incorporate their wholesome recipes into the menu. “They push us to our very limits,” Heinzmann said, adding partnering with monks has proved to be conceptually and procedurally challenging due to intricate rules handed down over millennia. Unlike in Western cuisine, where the chef is the boss of the kitchen, in temple cuisine cooks must come to a holistic understanding of the “whole wheel of nature” involving seasonal rhythms, according to the culinary artist. Pointing out Korea has 24 micro seasons, he noted his team pays great respect to Mother Nature’s offerings, and does the “mise en place” -- a French gastronomic phrase meaning “putting in place” as part of precooking preparations -- in the farm, as opposed to the cookhouse. The Lounge’s chefs organize menus around their daily catches of seafood from Jeju Island, including abalone, octopus, sea urchin and a variety of fishes. The venue also features honey sherbet bingsu (a shaved ice dessert) with honey collected from Wallak Mountains in North Chungcheong Province. 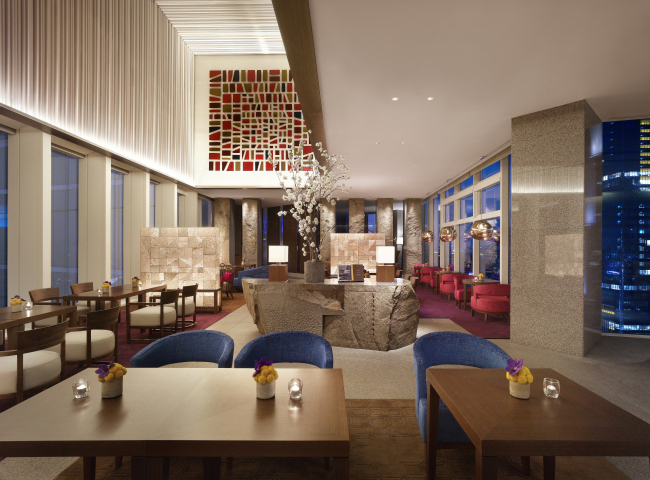 Located on the hotel’s 24th floor, The Lounge was recently renovated with a sleek interior, offering a bird’s eye view of downtown Seoul. Striving to excel in “comfort dining,” it is where guests can relax and feel comfortable in a cozy setting. 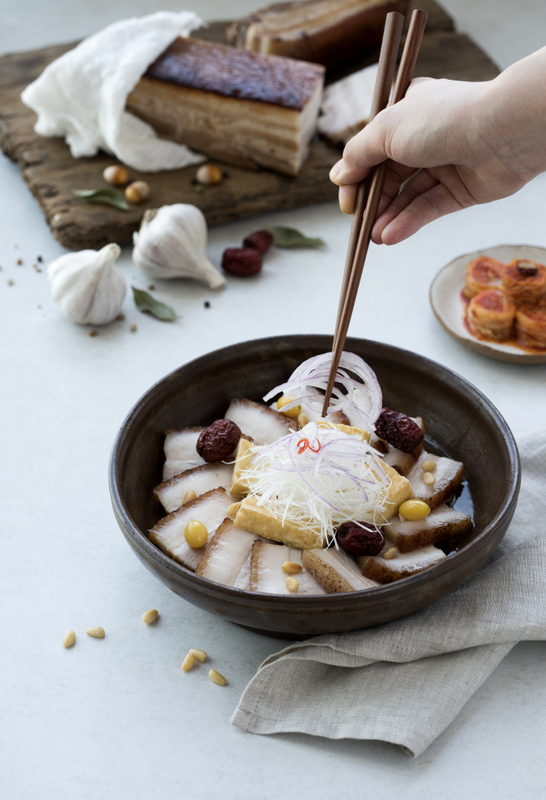 The Lounge offers as signature dishes pan-fried mackerel and steamed pork belly bossam, which are paired with traditional Korean liquors. 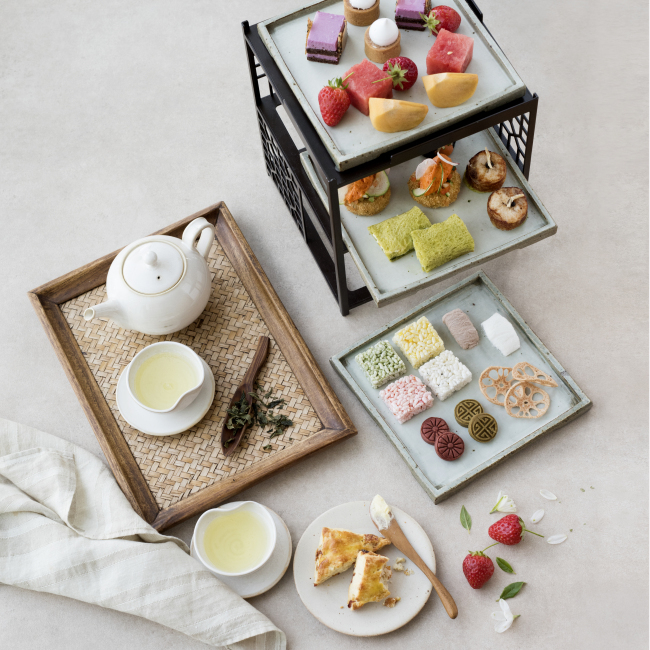 A selection of premium green tea of Woojeon, Gokwoo, Sejak and Jukro varieties are served with traditional desserts such as hwajeon, flat sticky rice cake decorated with flower petals. The tea is offered with a traditional Korean tea ceremony. 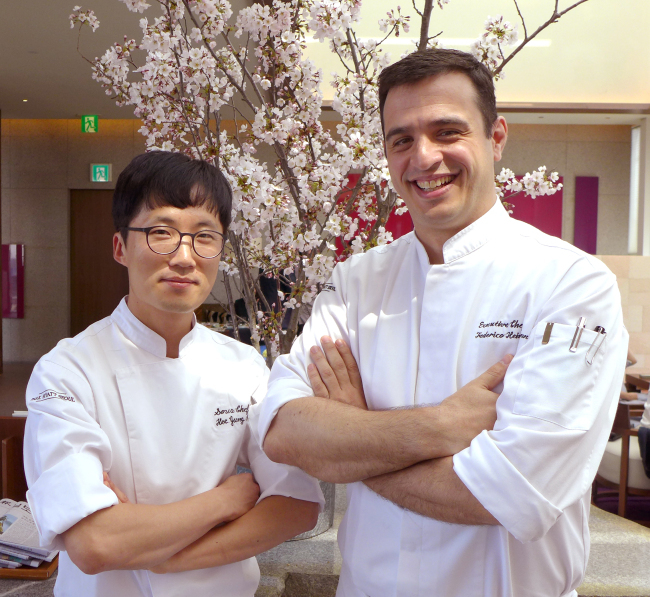 Justin Hee-jung Kim, sous chef of The Lounge, said he and Heinzmann have collaborated with much efforts to discover and innovate connections between Korean and Western cuisines. Explaining that the three basic flavors of Korean gastronomy are saltiness, sweetness and spiciness, the sous chef argued that creating savory tastes by combining the three was highly daunting and complex. The restaurant has a rooftop garden where various soy sauces, bean pastes, red pepper pastes, juices and teas are fermented for use. Using modern techniques such as low temperature cooking “sous vide” or pressed braising, The Lounge also serves popular Korean dishes beef bulgogi and galbi barbecue, as well as bibimbap, all prepared with fresh vegetables.